I’ve struggled to find Valentine decorations I like. I’m really trying not to have “stuff” for the sake of “stuff”. Similar to the guide used by Tsh of Simple Mom, I’m trying to choose things for my home that I find beautiful, useful, or meaningful. And the standard decor in the Valentine aisle wasn’t fitting any of those three targets. Inspired by these posts by the Nester and Childhood 101, I decided to make these Valentine canvases with my three boys. They were fun and easy and produced decorations for Valentine’s Day that will be beautiful and meaningful for years to come. I simply base coated the canvases, then cut hearts from vinyl for my boys to decorate their boards. (I assume contact paper would work as well.) With the vinyl in place my boys set out painting over their designs using a variety of acrylic craft paints and texture tools (rollers, slinkies, combs, sponges, and brushes). After the painting was done, I used a razor blade to loosen the edges and remove the vinyl (the paint was partially dry). 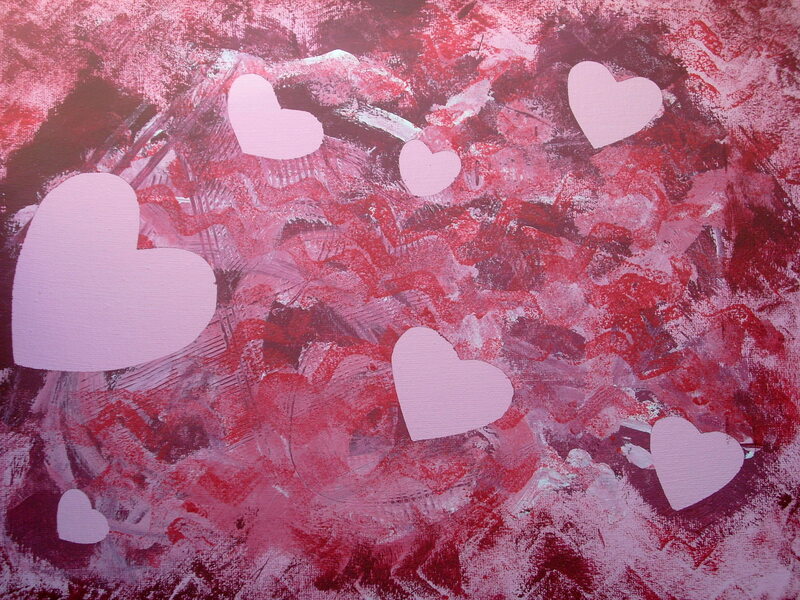 It’s a fun, quick, creative activity that you could do today as a part of your Valentine’s Day festivities. Have your child sign the back and add the date, and you’ll have a beautiful, meaningful decoration for many Valentine’s Days to come! You’ll love the reminder of those little hands creating the art, and your children will gain a sense of value and ownership as their own art is used to beautify your home. They are gorgeous, we have more homemade art and decoration hanging in our home than store bought. I love these – homemade projects always get my vote over cheap plastic decor. This one is esp. great ’cause you also get a fun activity to do.